Come see amazing costumes and skits as contestants compete in this year’s Masquerade. Judging in Rio Grande between 12pm to 3pm on Saturday. The Sabaku Con Masquerade is an amateur costume and skit competition. Contestants may either perform a Walk-On or a Skit. Costumes related to Anime/Manga, Asian Origin Video Games and J-Rock are allowed to be entered in the competition. Entrants may also enter costumes from comic books, movies, television shows, cartoons, and video games if entries are available in the Masquerade. All Masquerade contestants must comply with Sabaku Con’s Code of Conduct. The Masquerade will have a limit of 50 entries. Each person may only participate in one entry. Each entry may only appear on stage one time. Groups are limited to 10 members. Each contestant or group contact person must check in at the Cosplay Desk before the Masquerade. Times for the Cosplay Desk will be given at a later date. Contestants must report to Craftsmanship Judging on time. Times will be given at a later date. Contestants must report to the Masquerade Green Room on time. Times will be given at a later date. On line registration will close Monday, May 6th at Midnight. At Con registration will be available if entries are available. All Skit entries must be 3 minutes or less and all Walk-On entries must be 1 minute or less. There will be no microphones on stage for contestant use. All audio for the performance must be prerecorded. All performances must be PG-13. Any performances with stunts must receive approval from the Masquerade Director before the event. The use of open flame, flash powder, fireworks, lasers, smoke machines, etc. is prohibited. Any props used on stage must be able to be removed easily and must leave the stage in the same condition as it was before the prop was used. Interaction with the MC is prohibited. The Masquerade Director reserves the right to eliminate anyone from competition on the basis of taste, danger to the audience or other contestants or for any other reason deemed sufficient. 80% of costumes and props must be made by either the contestant wearing the costume or by other members of the contestant’s group. Purchased or Rental costumes can only be entered as “Out of Competition”. “Out of Competition” entries will be allowed if space permits. All Props must conform to Sabaku Con’s Weapon’s Policy. Costumes that have previously won awards at other conventions are prohibited from entering Sabaku Con’s Masquerade. Any costume being presented for Craftsmanship Awards must attend Craftsmanship Judging. Costumes are not required to be worn during Craftsmanship Judging but it is highly encouraged. Reference pictures of costumes are highly recommended for Craftsmanship Judging. Progress pictures of costumes are highly recommended for Craftsmanship Judging. Music will not be provided for entries. Recordings that run over the 1 minute Walk-On time limit or the 3 minute Skit time limit will be cut short. Dialogue/music must be submitted in an audio CD format or USB Flash drive. Dialogue/music must be the only track on the CD or USB Flash drive. CDs and USB Flash drive will not be returned to the contestants. MC Narratives are for the contestants walk on/skit only. No outside advertising allowed. All MC Narratives must be approved by the Masquerade Director. If the narration is not approved, you will be contacted beforehand and will be able to change the narration. Any contestant 12 years of age and under at the time of the masquerade may compete in the Youth Division. The Youth Division is divided into two subdivisions. Youth Self-Made- A Youth contestant who has constructed the majority of his/her own costume. Youth Adult-Made- A Youth contestant whose costume has mostly been constructed by an adult. A contestant who has won "Best in Show" or "Best Novice" at any masquerade competition may not enter in the Novice division. A contestant who has won three or more major awards in the Novice division at masquerade competitions will need to enter in the Journeyman division. A contestant who has competed and won in the Master division at any masquerade competition may not enter in the Journeyman division. A contestant who has won "Best in Show" or "Best Journeyman" at any masquerade competition may not enter in the Journeyman division. A contestant who has won three or more major awards in the Journeyman division at any masquerade competition may not enter in the Journeyman division. Any contestant may enter in the Master division. 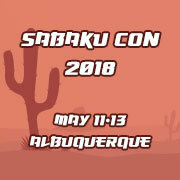 Any questions about Sabaku Con’s Masquerade can be sent to masquerade@sabakucon.com.